Right now there’s a welcome initiative in Britain called Call Time on Duty, organised by the Wine and Spirit Trade Association. The aim is to persuade George Osborne to scrap the automatic duty escalator in this year’s Budget on 19 March. Source: data from ec.europa.eu, with update for Ireland. UK duty on sparkling wine is £3.07, including VAT on the duty but not on the wine. Yes, that’s right. 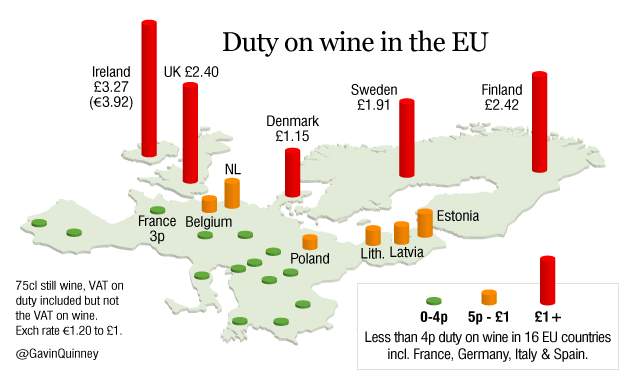 In France, Spain, Italy, Germany and a dozen other EU countries the duty on wine is less than 4p a bottle. Even in Brussels – hardly a centre of wine production – they pay just 40p, £2 less than the UK, and nearly €3.50 less than in Ireland. And don’t forget, duty is an added cost to supermarkets, wine merchants, pubs and restaurants; most of the time, they have to make a margin on that additional cost. See Where the money goes on a bottle of wine in the UK. As for Sweden and Finland, both countries operate state-controlled monopolies. In Sweden, Systembolaget runs ‘the smartest wine shops in the world’, according to one experienced traveler in the trade, while wine lovers in Finland have to buy through Alko. They do charge a ‘cash margin’ over the duty for the retail experience, but it’s fair to say that both countries are actively involved for the duty they charge on each bottle. So how did duty in the UK get so out of whack? In an important case, the European Court ruled in November 2006 that in order for consumers to buy wine from another EU country with a far lower rate of duty, they had to bring the goods back themselves – and not simply order online and have them delivered. Coincidentally, the Labour government hiked UK duty in 2008 and introduced the alcohol duty escalator, automatically bumping up UK duty on wine by 2% above inflation every year. The Conservative-Lib Dem government continued with the policy, with hardly a mention in the Budget speech other than ‘no further changes to those already announced by the previous government’, so by 2013, duty had increased 54% in just five years. The poor Irish, meanwhile, have seen duty leap from second place with €2.40 three years ago, to €3.92 today. 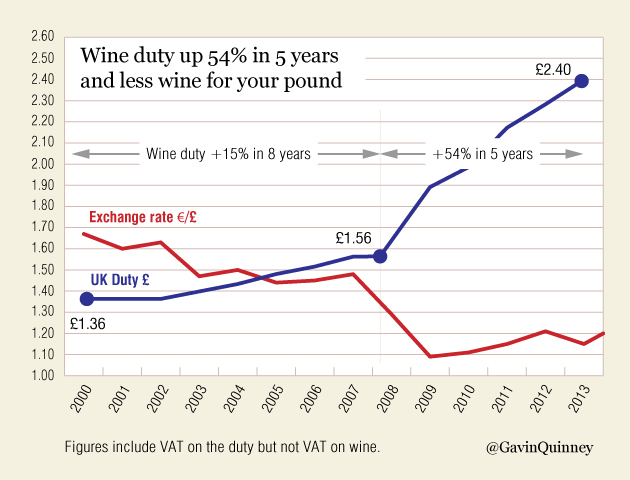 On a £6 bottle of wine – which is still above the average spend in the UK – 50% is tax: £2 duty with £1 of VAT. Enough is enough. If you want to lend your support with the minimal amount of effort, click this link to the Call Time on Duty website and fill in your name, email, UK postcode and address; they take care of the rest by sending a letter to your MP. Feel free to share this on Twitter or Facebook, or leave a comment. Here is my tweet, with the map. The campaign’s Twitter handle is @CallTimeOnDuty – please follow them. At least until March 19th.